McDonald’s: It’s the addictive french fries, the inexpensive hamburgers, and the golden arches that rise over the fast-food chain. Those golden arches can be found around the world, in over 117 countries according to the Chicago Tribune. But that doesn’t mean you’ll find the American-style hamburgers and fries that turned McDonald’s into a billion dollar franchise. The McDonald’s menu varies from country to country and you may be surprised when you see what has replaced the simple hamburgers and salted fries. Check out this photo slideshow of some of the strangest McDonald’s menu items from around the world. 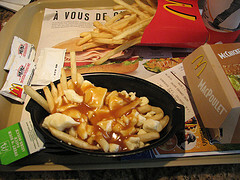 Poutine: In Canada, McDonald's customers have the option to get Poutine instead of fries with their meal. The side item is a bowl of french fries drenched in gravy and topped with cheese curds.